This Sunday I'll probably settle in on the couch with something good to eat and watch the Golden Globes. 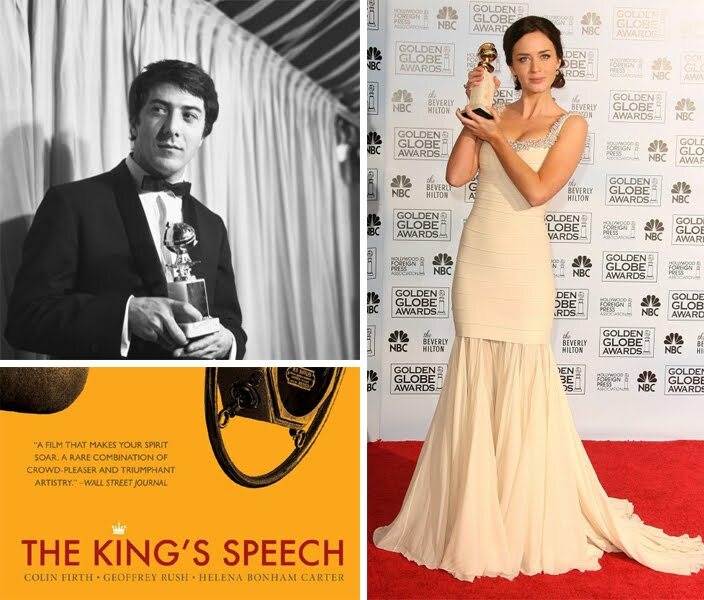 I'm rooting for the King's Speech and its cast (it's fun to see what everyone wears, too). Q just rolls his eyes at me and stays away. Will you be watching? Hope you have an awesome weekend. ah! I might just have to watch. Hope you have a fantastic weekend, alli! i love awards shows! i used to watch the oscars every year with my dad, he would get a bunch of different candy and spread it out like a buffet. I saw an advert on our tv today that it is being shown here at about 1am, so I might just have to record it and watch it at a more sensible time. i used to watch! sad to miss it. I totally watch, and am so sad I will be on a plane tonight! Chris thinks I am stupid for watching it as well! haha...guily pleasure I guess! Patriots are playing now, so when it's over I have put my request in for the Globes :) My favorite is the red carpet though! i am a total awards show junkie. :) kenny always teases me too! Anyways a lot of pink and emerald green on the runways and yes Natalie Portman won! i watched the globes too. i agree with the previous comment, lots of pinks and greens! who was your favorite? i loved claire danes & anne hathaway!